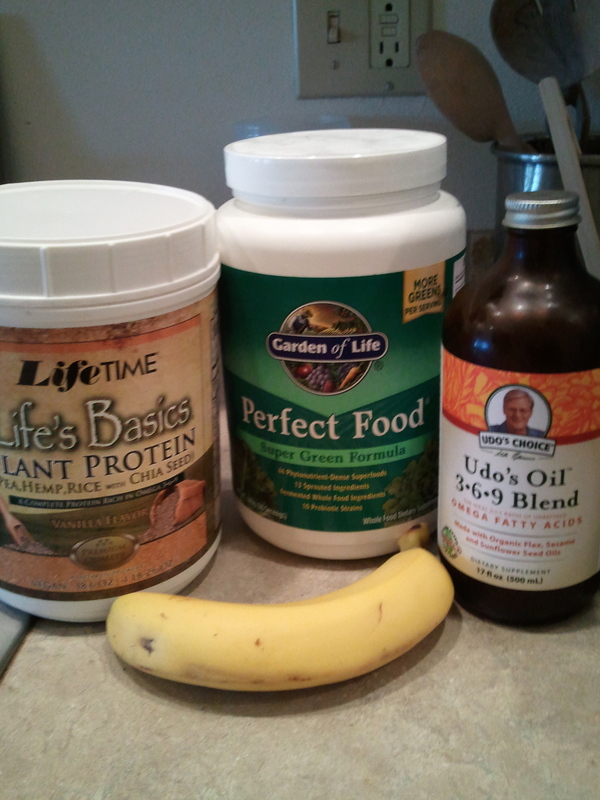 The ingredients for the world's perfect smoothie! 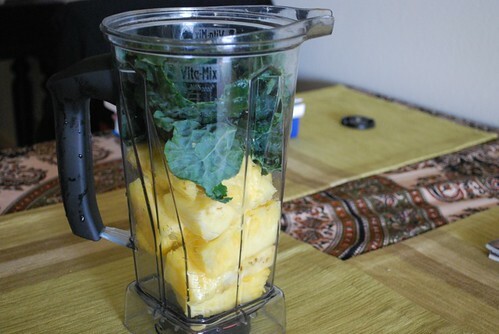 I’ve been enjoying this smoothie for about 3-5 days per week for a long time. I tweak ingredients every now and then but the recipe below is a good standard approach THAT WORKS. I use it for breakfast most days. Sometimes I’ll use it as a recovery drink after a bike ride or run (as I am doing right now!). 3 heaping tablespoons vegan protein (I custom order from Trueprotein.com with a blend of non-GMO hemp, rice and pea proteins. You can also try Life Time’s Life Basic Blend or Vega’s Smoothie Infusion). If you’re first reaction is “holy crap that’s a ton of fat…there’s no way I’m gonna drink all that fat!”…don’t worry. I challenge anyone to consume this drink on a regular basis and gain any extra fat on their gut or behind. In fact, chances are you’ll shed a bunch of pounds. High quality fats are high quality fuel. Udo’s Oil is some of the best stuff around, and they recommend taking 1 tablespoon per 50 pounds of bodyweight daily. I use just 2 tablespoons in my smoothie and try to get other good fats in through whole foods (coconut butter, avocados, etc.). If you have an especially brutal training day or work day ahead of you, add 1-2 additional bananas to give you the extra fuel to power through (make sure they are super ripe to ease digestion). Give this smoothie a shot – try it three days in a single week at least, ideally in the morning – and drop a note in the comments to let me know how you feel. It is rasberry season! Finally, I can enjoy these wonderful berries fresh without having to pay and arm and a leg. I picked up an entire tray (6 overflowing pints) of rasberries for $15 from a local farmer’s market (all organic of course). I could probably get them cheaper, but that would require a drive outside of town. Throw half-pint of berries, a super-ripe banana and a heaping tablespoon of hemp seeds into your Vita-Mix. Blend for about 10 seconds and enjoy. I use the whole hemp seeds in this recipe to get more of the good fats (as opposed to just using the hemp protein isolate). Hemp is an amazing source of Omega 3 fatty acids, and is also a complete and full-spectrum protein source – with all the amino acids your body needs to build muscle. It is oh so simple but oh so good. Anywould would LOVE this. Adults, kids, people who don’t like to eat fruits and veggies, health freaks, EVERYBODY. It looks good and tastes better. I am drinking this right now before heading to work (after teaching morning yoga practice). You don’t even need a great blender (like a Vita-Mix) to do it (though I think everything tastes better in a Vita-Mix!). Makes 3 tall glasses of smoothie goodness. About 350 calories or less. Plenty of fiber, vitamin C and other natural antioxidants. More potassium than you could ever hope for. Behold, the power of the Vita-Mix! I had a green smoothie after yoga class today. It consisted of one-half of a medium sized organic pineapple and 4 large leaves of dino kale. I strip the thick stem out of the kale, and just throw the dark green leaves in. This tastes really good. The sweet and tangy-ness of the pineapple is the over-riding flavor, but the slight bitterness of the kale also comes through. What a great way to get greens into your diet! Put the raw ingredients in the Vita-Mix + 16 ounces of water (depending on how thick you want it to be). 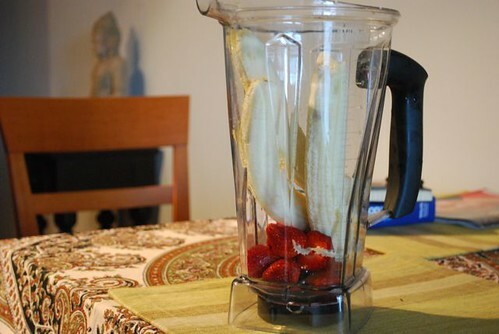 Blend it for 60 seconds and you are good to go. It comes to about 250-300 calories in total, almost all from the fresh organic pineapple. In fact, some feel that pineapple is practically a negative calorie food due to it’s digestive enzymes, high fiber and vitamin content. I’m a big fan of smoothies in the morning. A while ago I wrote about my Raw Power Smoothie, an all vegan and mostly raw concoction that would keep me going most of the day. Nowadays, I’m in the groove of doing more fruits, mostly bananas, with some maca powder and a heaping tablespoon of vitamineral green. I forgo the protein powder and other things. I find that sticking with more of a fruit base and going lighter on the protein actually feels better in the morning. The key to making this smoothie work and taste great is to get high quality organic bananas. Most people eat bananas when they are still “raw” and green and totally spot-free. Eating bananas like this will give you problems….gas and other digestive issues. They also don’t taste as sweet! I like my bananas nice and spotty, there might be a touch of green near the stems, but the rest is deep yellow with plenty of brown spots on the peel. The peel should also come off very easily. If you have to hack away to open your banana, it isn’t ready yet! Note: if you need to ripen bananas, stick them in a closed bag in a warm place. Now I am off to drink my post yoga class smoothie! 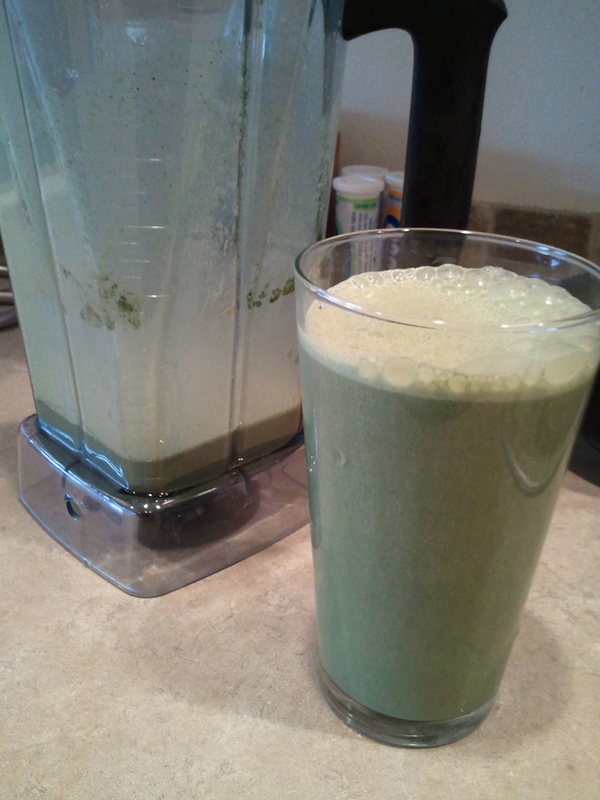 (4 large organic bananas, 20 ounces water, vitamineral green powder and maca powder). What is your favorite smoothie? Let me know in the comments!